This beautiful insect looks like a beetle, but it is in fact a bug – a true bug as entomologists call hemipterans. 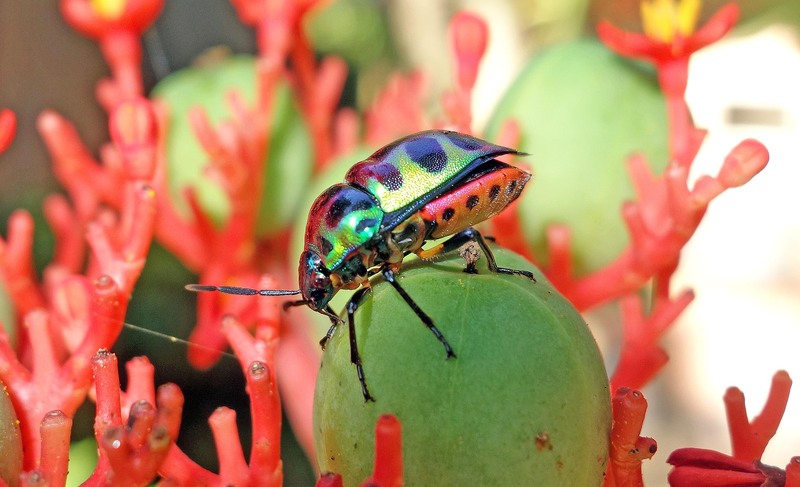 It is a member of the family Scutelleridae and is commonly called a jewel bug or a metallic shield bug. The Lychee Shield Bug or Green Jewel Bug, Chrysocoris stolli, is widely distributed throughout south Asia and South East Asia: from India to the Philippines. Despite its fabulous appearance, it is a bit of a pest, reportedly feeding on some food plants and medicinal plants (1). One of these plants – Cassia occidentalis – is an exotic and widespread weed in India, and this insect is being considered as a potential biological control agent (2). 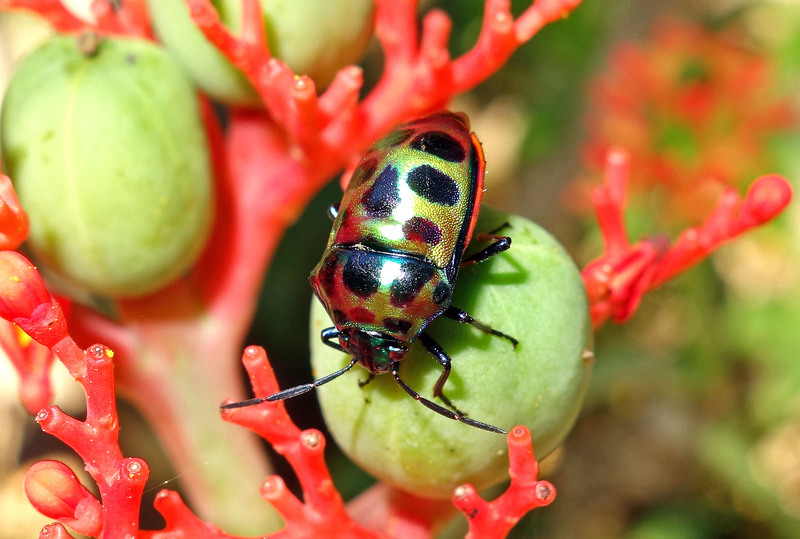 The fact that it is called the Lychee Shield Bug suggests to me that it might be fond of supping on lychees! It feeds on a wide range of plants, including some of those that happen to be grown by man! But hey, these bugs have been around an awful lot longer than us! I came across this insect in Chiang Dao – north of Chiang Mai – in northern Thailand. The shield-like back of the insect – with the pronounced bulge at the front of the abdomen – is seen below. They are sometimes called shield-back bugs. In jewel bugs the scutellum – small shield-like structure – has expanded to cover the whole abdomen with the wings located underneath. For a really fantastic blog on South East Asian Scutelleridae – I’m in awe of the photography on this website – check out Spineless Wonders by David Knowles (3). Pravesh Kumar and SC Dhiman (2013). Some Ethological Aspects of Chrysocoris Stolli Wolf (Heteroptera -Pentat Omidae –. Scutellerinae). Journal of Zoological Sciences 1(1), 8-12. Sehgal, P. K., and S. C. Dhiman. (2015). Effect of temperature and relative humidity on the occurrence of Chrysocoris stolli Wolf (Heteroptera Pentatomidae Scutellerinae) a potential biocontrol agent of Cassia occidentalies.